Didn't have them in Halifax and not likely to be arriving now. Did they say why not? No. She had never heard of them, they weren't in the catalogue and they weren't on the truck. She suggested I buy it on the internet, which for me involves a long drive to a god forsaken distribution centre on a distant trading estate where I can be ignored by youths in Leeds United shirts. Mine was left with a neighbour a couple of doors down; wasn't a royal mail delivery, it was another firm. If you have neighbours in during the day, maybe it'll be worth a punt? "Exclusive offer for home shoppers". If they're not at work, they're on drugs. Can't you have it delivered to your work address? It's banned, we've got nearly 1000 people on site here and the poor receptionist was getting snowed under. The very helpful lady mentuioned that someone else had called about it this morning, was that you Nora? Slightly off topic, but on the same Tchibo page, there's a �35 slicer. Has anyone any knowledge/experience of it? Do they send things out Royal Mail or is it courier? Tchibo use a courier firm ParcelNet for delivery in Britain, as far as I know. Maybe everybody knows this already, but if you're a new customer there are various discount voucher codes available to use (free delivery/�3.95, another is �5 off a �20 first spend). A google search will throw up something or search the forums at moneysavingexpert.com . I couldn't sign up at their website to order, so had to order by telephone. Haven't seen the card charge yet, so can't say for certain my discount code worked. Thanks HeThinks, thats useful to know. 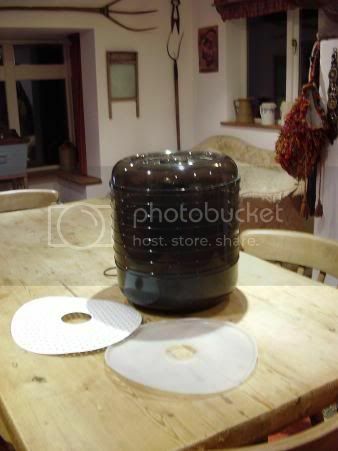 Last year I managed to pick up a food dehydrator very similar to the one in the link . I paid �2 for it from a bootfair. I think it has a few more trays than the one shown and a couple of silicon type liners that you can add to the trays for drying out fruit leathers etc .It also had a mandolin type cutter to slice food really thinly in with it.So it was a good bargain! I can't see a makers name on it anywhere ?But it works fine and I use it mainly in late summer to dry tomatoes and other fruits and veggies etc . In the winter I tend to use my Rayburn's cool oven ,as that is running anyway and it seems silly not to use it. Some bargain , that, Naomi.....I wonder if could use a steamer, perhaps works on the same principle. Blast from the past, my tchibo is still going and these days is hardly ever back in a cupboard it gets used that much.